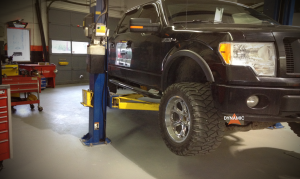 We take pride in knowing that we have the best diesel technicians in Kelowna that can work on your car or truck. An F150 on the hoist. We also perform diesel engine rebuilds and repairs. Our technicians will give you a detailed report about the status of your diesel engine, the repairs and parts needed along with the time it will take to perform the service. We will hook up your vehicle to our state of the art computer system and do a thorough scan and test. Our technicians are very experienced and will quickly diagnose the problem in your diesel engine and let you know what the issue is.